As most have already noticed, the old quest log is gone and we have a shiny new map+quest log hybrid in Warlords of Draenor. This addon's initial behavior is to commandeer your quest log key binding and micro button to toggle the new log. It should be a familiar enough experience once you log in. Open the map via key binding (M is default key) will display the new map+quest log hybrid. Click 'Show Map' in the upper right of the Classic Quest Log, it will jump to the map of the quest's zone with the attached new style quest log. If that's not enough and you only want to use the Classic Quest Log occasionally, go into Key Bindings -> AddOns -> Classic Quest Log and set a binding to toggle this addon's window. Once a binding is set, it will revert the behavior of the default quest log binding and quest micro button to its map+quest default behavior. Instead of saying (Completed) or (Daily) beside each quest name, they are now represented by icons just like the new log. Instead of adhering to the "panel" rules, it can be anywhere on the screen and dragged around. There's a toggle at the bottom of the window to show quest levels. There's also a toggle to show tooltips of the quests. If you don't know what the quest icons mean, the tooltip will tell you. 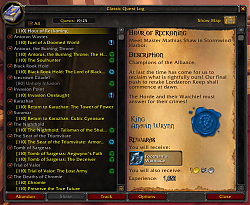 - Added a header above war campaign quests in the left pane of the quest log. - Updated toc for 8.1. - Fix for Lua error when attempting to display quest portraits. - Update for Battle for Azeroth client. - Fix for PlaySound when sharing a quest in 7.3. - toc updated for 7.3. - Quest NPC portraits will now display when a quest with a portrait is selected. - While using ElvUI or Aurora, a new option "Use Classic Skin" is available to prevent skinning for those UIs. - Reworked internal quest selection/update process. - Fix for the abandon quest dialog dismissing without an obvious reason. - Fix for quest detail pane scrolling to top without an obvious reason. - The Solid Background option changed to Dark Background. It now makes the details portion light text on a dark background. - ElvUI skin is applied if ElvUI is enabled. - Aurora skin is applied if Aurora is enabled. - When shift+clicking a quest on the objective tracker to stop tracking it will no longer summon the quest log. - Clicking an objective in the objective tracker will summon the quest log instead of the world map. - Fix for +/- buttons on quest headers not properly indicating if the header is collapsed. - Fix for quests not linking to chat. - Quests flagged as hidden will now be hidden. - Headers that contain only hidden quests will be hidden also. - Added open and close sound to the window. - Fix for hitting "Close" button breaking the "panel-ness" of the window. - Fix for number of groupmates on a quest remaining when a quest category is collapsed. - If the default quest frame is up while summoning Classic Quest Log, the default quest frame will be hidden. - Added option "Solid Background" to make the background behind text solid to improve readability. - Hitting ESCape while the little options window is open will close options without closing the whole quest log. - Fix for opening map or details window from another source sometimes breaking Classic Quest Log's panel behavior. - Like the original quest window, the default behavior of the Classic Quest Log is now to dock on the left and move over as default UI panels appear. - Undock Window: This will allow dragging the window around the screen. - Lock Window Position: While the window is undocked, this will prevent moving the window unless Shift is held. - Show Resize Grip: This will allow resizing the height of the quest window. 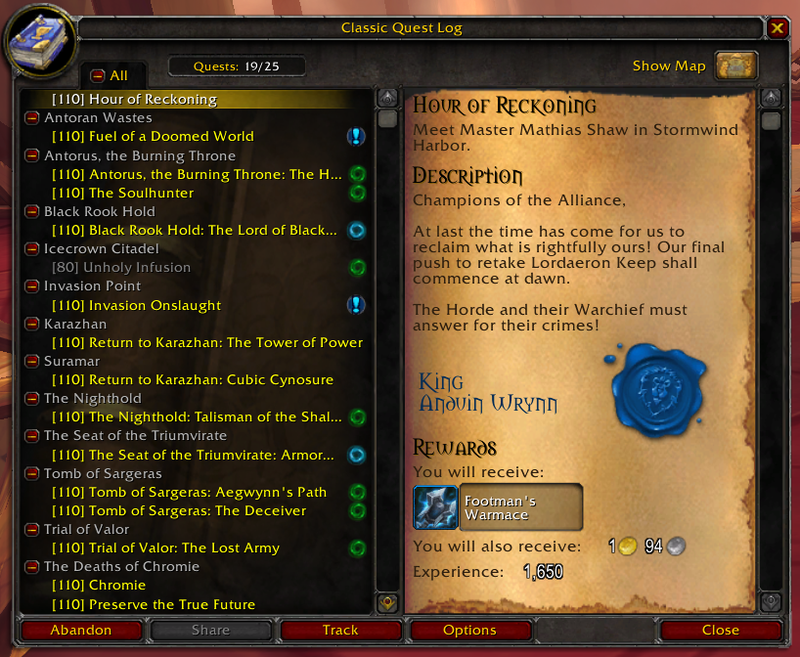 - Show Quest Levels: This is the old option to show levels alongside listed quests. - Show Quest Tooltips: This is the old option to show tooltips when you mouseover listed quests. - Quest tooltips are more complete. - Fix for bug where a separate key binding is defined but addon is still overriding default key/button. - Multiple quest update events within one frame will update the log once instead of for each event. Oh hah. Maybe! That does put it in a different light. Hey you scumfuck why I can't donate to this quality of life project? There are times when I wonder if it's possible for an addon author to make sure that one person can never ever use their addon. Perhaps politeness might be in order? Tonight's update will skin for ElvUI and Aurora and has also changed the option Solid Background to Dark Background. One of the reasons I was reluctant to make a dark background for the details pane is the quest details has a lot of elements that aren't always used. I believe I got them all but it's possible some were missed. It does help thanks! I expect to have a minor update for 7.2 tomorrow, I'll see if I can get some time to find out what's happening between the two addons. edit: I've had some time to look. This behavior will happen regardless what quest addon is used alongside ConsLegion because that addon is forcibly selecting the last quest in the log very frequently. At a glance, this behavior seems unnecessary (as opposed to simply using the index of the quest) but maybe I'm missing something. Classic Quest Log obeys the default quest log behavior. If another addon is forcibly changing the selected quest, there's not a lot this addon can do to stop it, sorry. I know that's an unsatisfying answer. I just turned ConsLegion off, but I'll bookmark this for when I start up a new alt and run into the issue again. Thanks! And yeah, that does seem unneeded. i loaded a alt with all addons disabled and its on my end your mod works great by itself. its a conflict from something else. the current version for me is showing the quest text in white which is making it border line un readable. black text would help tremendously. also if Aurora support could be added that would be great. Can you post a screenshot? The default UI is intended to control the color of some text, this addon controls other parts. Last edited by Kithalaul : 04-01-17 at 11:39 PM. It's ConsLegion. I have everything but those two turned off and it will instantly select the last quest in log when and only when ConsLegion is loaded as well. No matter what, fresh install or old settings my system displays the behavior. I hope this helps narrow things down. Last edited by Gello : 03-27-17 at 04:10 PM. Recently a rather annoying behavior has begun occuring: When I select any quest in my log, within 1-2 seconds the selected quest reverts back to the quest that sits at the bottom of the log. I have abandoned my entire log and this happens at any point there is more than one quest in my log. It's character specific as well, and there are no errors being thrown. I am stumped as to what could be causing it. I'll take a look. In the meantime, I know it's a hassle, but could you try disabling all other addons and seeing if the behavior persists? If the behavior stops, enable a few at a time until it starts happening again to see if another addon is causing that behavior. Then let me know if what addon, if any. If the behavior persists with no other addons enabled, that'd be important to know too. Last edited by Peerly : 03-27-17 at 11:07 AM. This is perfect! I've always hated them attached to the map. Could you please add skinning to match ElvUI.